Florida GOP gubernatorial candidate Rick Scott is out with a new ad Tuesday that has been condemned by the Republican Governors Association. (CNN) - Florida's Republican gubernatorial primary keeps getting hotter. Former health care executive Rick Scott released an ad Tuesday tying his opponent, Florida Attorney Gen. Bill McCollum, to the disgraced former chairman of the state's Republican Party. 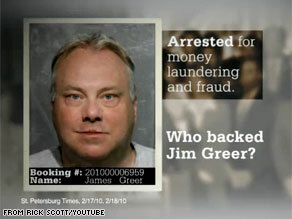 "Party Boss Jim Greer - arrested for money laundering," the ad begins. "And who backed Jim Greer's effort to hide financial irregularities? Bill McCollum." Scott has criticized McCollum for what he says is the attorney general's unwillingness to call for the release of the state Republican Party's documents. On Tuesday night, the Republican Governors Association, which has not endorsed either candidate, condemned Scott's ad and called for him to "pull this ad and move forward in the primary in a constructive manner." 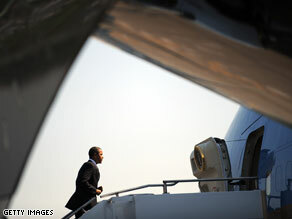 President Obama boarded Air Force One Tuesday in Seattle, Washington. A pair of sonic booms were heard and felt from two fighter jets scrambled when a plane entered restricted airspace while Obama was on the ground. (CNN) - Residents in Seattle, Washington, were shaken Tuesday afternoon by what sounded like explosions after two F-15s were dispatched in response to a report of a small plane that entered restricted airspace where President Barack Obama was campaigning for Sen. Patty Murray. The rumblings - caused by sonic booms from the jets - rattled buildings, windows and nerves in the Puget Sound region, according to CNN affiliate KIRO. Viewers of the affiliate from as far away as Tacoma - about 40 miles south of Seattle - reported hearing the booms. Dozens of residents called the city's 911 system, causing it to shut down in some areas for about an hour due to the flood of calls, Ed Troyer, a spokesman for the Pierce County Sheriff's Department told KIRO. "Many house and car alarms have been set off that we will not be able to respond to," Troyer told the affiliate. Former Illinois Gov. Rod Blagojevich was found guilty on Tuesday of making false statements or representations to the FBI. Chicago, Illinois (CNN) - Former Illinois Gov. Rod Blagojevich was found guilty on Tuesday of making false statements or representations to the FBI. The jury, which deliberated for 14 days, said it was hung on 23 other counts against him and on the charges against the former governor's brother, Robert Blagojevich. The former governor faced charges including racketeering, wire fraud, attempted extortion and bribery. A two-term Democrat, he was removed from office in January 2009 amid accusations that he attempted to sell the U.S. Senate seat that had been occupied by Barack Obama before Obama was elected president. "I feel bad for my brother," said Robert Blagojevich, who spoke outside the Chicago courthouse shortly after the jury's decision. Fox News' objectivity was called into question by the DNC on Tuesday after it was reported that the cable network's parent company – News Corporation – recently donated $1 million to the Republican Governors Association. 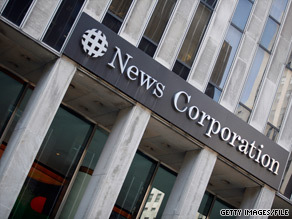 (CNN) - The Democratic National Committee called into question Fox News' objectivity Tuesday after it was reported that the cable network's parent company – News Corporation – recently donated $1 million to the Republican Governors Association. "'Fair and Balanced' has been rendered utterly meaningless," Hari Sevugan, the DNC's national press secretary, said in a statement. "Any pretense that may have existed about the ties between Fox News and the Republican Party has been ripped violently away. "No Republican who appears on Fox can be seen as answering to an independent press and all should appear with a disclaimer for who they truly are – the favored candidate of the corporate-friendly network. No Fox News political coverage can be seen as impartial and all of it should have a disclaimer for what it truly is – partisan propaganda." Florida Senate candidate Jeff Greene says he'll sue two Florida newspapers if they don't retract three stories they've published about him. 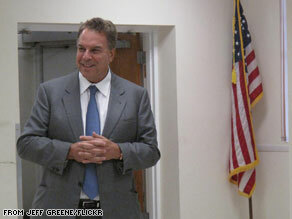 (CNN) - Florida Senate candidate Jeff Greene is a billionaire real estate investor who has spent millions to fund his primary campaign against fellow Democrat, Rep. Kendrick Meek. Now, one week before Florida's primary elections, Greene is preparing to spend his money on a lawsuit against two Florida newspapers if they don't publish lengthy retractions to damning articles they recently published about him. Greene's lawyer has demanded the St. Petersburg Times and the Miami Herald publish the retractions to correct three articles the newspapers published earlier this month. The articles were written by St. Petersburg Times reporters and were first printed by the Tampa-area newspaper. The Miami Herald printed the articles shortly thereafter. The papers have a working partnership and often share resources to cover state news. Times editor Neil Brown said last week that no retraction is forthcoming, and Greene is expected to follow through, potentially as early as Friday. The Democratic women's political group EMILY's List launched a new campaign Tuesday, taking on conservative candidates endorsed by former Alaska Gov. Sarah Palin. Washington (CNN) - The Democratic women's political group EMILY's List launched a new campaign Tuesday, taking on conservative candidates endorsed by former Alaska Gov. Sarah Palin. "We didn't want Sarah Palin's voice to go unchallenged," EMILY's List President Stephanie Schriock said at a Washington news conference. 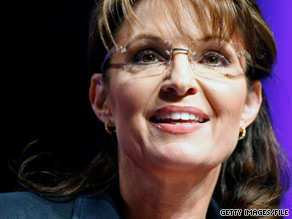 She said the campaign, 'Sarah Doesn't Speak for Me' is a way to "call upon women and men to let their voices be heard and to reject Palin's reactionary candidates and backward-looking agenda." Palin has endorsed candidates in gubernatorial, Senate and Congressional races around the country, calling the women candidates she backed "mama grizzlies." EMILY's List has made its own series of endorsements in races nationwide. Schriock said the campaign was created because the candidates Palin has endorsed are "extreme" and "bad for America." Schriock focused criticism on candidates like Republican Senate candidate Carly Fiorina, who will face Democratic incumbent Sen. Barbara Boxer in November. 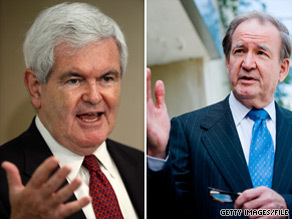 Former Republican House Speaker Newt Gingrich, left, is being criticized by conservative stalwart Pat Buchanan. (CNN) - Former House Speaker Newt Gingrich's latest comments regarding the controversial Islamic center near the site of the 9/11 World Trade Center attack are being called "absurd" - from no less a conservative stalwart than Pat Buchanan. Speaking on MSNBC on Tuesday, the former presidential candidate and conservative commentator said recent comments from Gingrich likening the proposed project to the hanging of a Nazi symbol outside the Holocaust Museum were merely part of the former Speaker's efforts to appear more controversial than Sarah Palin. "Newt is a political opportunist," Buchanan said. "What Newt is doing is he's trying to get out and be more flamboyant and more charismatic, if you will, and more controversial than Sarah Palin, who is his primary challenger, if he gets into Iowa and New Hampshire. She will take all his oxygen and a lot of his support." Retired Gen. Stanley McChrystal has signed on with Washington-based Leading Authorities to find him paid speaking appearances, the lecture agency announced Tuesday. 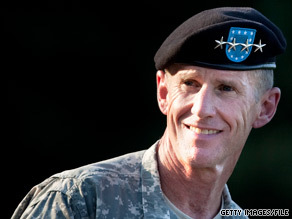 (CNN) - Retired Gen. Stanley McChrystal has signed on with Washington-based Leading Authorities to find him paid speaking appearances, the lecture agency announced Tuesday. McChrystal, who will also be lecturing at Yale this fall, will earn between $30,000 to $60,000 an event, according to one person knowledgable with the deal. The retired general has already booked "multiple engagements," the source said, and there has been a "significant amount of interest across industries" to hear him speak. His first paid speech will be this fall at a private engagement. 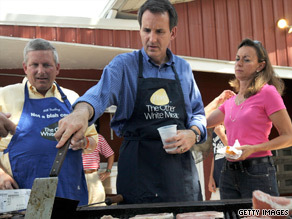 Pawlenty, who recently traveled to the famed Iowa State Fair, is getting tough on President Obama. (CNN) – Minnesota Gov. Tim Pawlenty - a likely GOP presidential candidate in 2012 - is stepping up his rhetoric against President Obama, saying the commander-in-chief is "clueless" when it comes to the economy and lacks common sense on the controversial mosque and Islamic center near Ground Zero. The two-term governor, long thought to be eyeing the White House, also said a decision about his political future will come early next year. "First of all he is clueless on a number of key issues on our time, including our economy," Pawlenty said of the president on Fox News' "Hannity" program on Monday. "We need to be growing this economy, lightening the burden for…the people that can get the economy going. Instead he is layering on burdens. And then, No. 2, he doesn't have the depth of experience to run a large complex organization particularly in a time of crisis and its getting away from him." Chicago, Illinois (CNN) - A verdict in the federal corruption trial of former Illinois Gov. 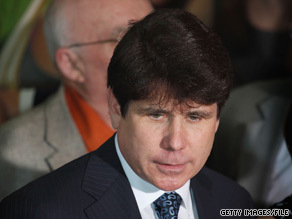 Rod Blagojevich could possibly come this week, the judge in the case said Tuesday. U.S. District Judge James Zagel said there is a "possibility" of a verdict this week and asked that the defendants remain within a half-hour travel distance from the courthouse. Jurors deliberated for a 14th day Tuesday. They had two questions for Zagel - in the first, they asked for a copy of the oath they took when they were sent to deliberate.